Nepal Stock Exchange (Nepse) index shed 31.09 points to close at 1,357.22 points last week, as investors rushed to cash out. The market that opened at 1,388.31 points on Sunday increased 50.18 points to close at 1,438.49 points. However, on Monday, the market dropped 27.64 points to close at 1,410.85 points. The downfall continued throughout the remaining trading period. As a result, the market plunged 15.99 points, 8.39 points and 29.25 points on Tuesday, Wednesday and Thursday respectively. 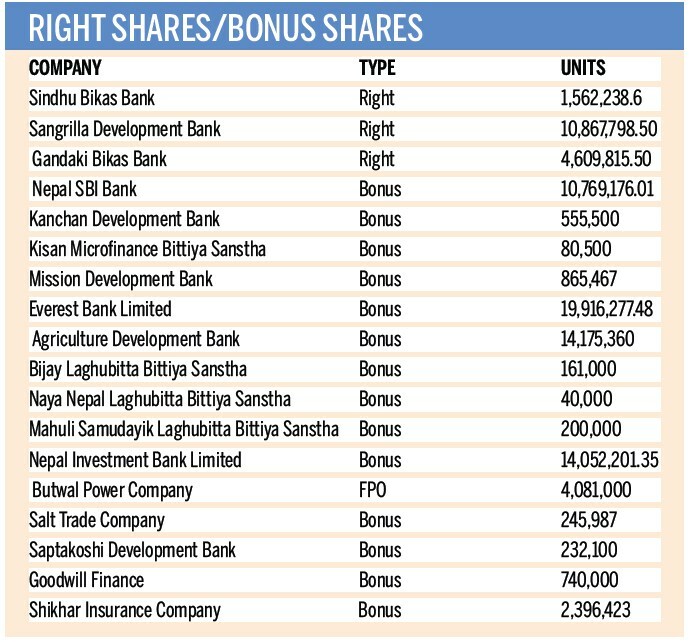 Stockbrokers attributed the move by small investors to book profit last week for the fall in Nepse. “There was no particular reason for the wide range of fluctuation appearing in the secondary market, however the selling pressure had nudged share prices to tumble,” said a stockbroker under condition of anonymity. The sensitive index that measures the performance of Group ‘A’ companies also went down 6.97 points to close at 287.06 points with all ten trading groups dropping points during the review period. Along with a fall in the market index, the average value of shares listed on the stock market also declined, afflicting investors with a loss of Rs35.32 billion, as the market capitalisation plunged to Rs1,592.62 billion from Rs1,627.94 billion over the week. All ten trading groups observed downward movement in their indices. Hotels lost the largest of 101.26 points to close at 1,978.28 points. Similarly, the sub-group of insurance fell 99.84 points to close at 6,913.49 points. It was followed by development banks (49.07 points), hydropower (47.72 points), manufacturing (47.19 points) and commercial banks (29.02 points). Likewise, ‘others’ shed 22.85 points from its index. Finance companies lost 13.01 points, trading lost 3.29 points and microfinance lost 2.64 points. Of the individual companies, Nepal Bank Limited led in terms of both transaction amount and volume of traded shares. The company witnessed transactions totalling Rs191.51 million from 524,000 units of shares exchanging hands. Likewise, promoters’ shares of Rastriya Beema Company saw total transaction worth Rs162.48 million to finish in second place. It was followed by general shares of Rastriya Beema Company, Nepal Life Insurance and Sanima Mai Hydropower Limited. Last week, stocks of 182 listed companies were traded. Despite a fall in the market index, the transaction amount increased 14.86 percent to Rs4.69 billion. The traded number of shares also inclined up to 10,185,000 units from 8,859,410 units.